The basis for the 3D Pulfrich glasses viewing technique (named for astronomer Carl Pulfrich) is that images seen through the clear lens reaches the brain slightly faster than images seen through the dark lens. With properly sequenced movement recorded on film or video, objects moving across the horizontal field of vision create the illusion of 3D. Traditional dark and clear Pulfrich works with television broadcasts and video presentations. Over a three-month period, American Paper Optics manufactured over 20 million 3D Pulfrich glasses with a custom lens combination for Televisa in Mexico. The glasses were distributed for a phenomenally successful month-long television broadcast. 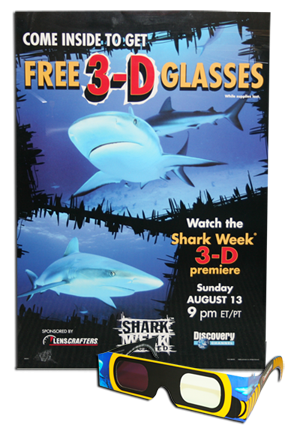 In the summer of 2000, LensCrafters distributed 6.4 million 3D Pulfrich glasses produced by America Paper Optics with a special patented 3D viewing system for an in-depth broadcast of Discovery Channel's® "Shark Week in 3D." Our specialized dark/clear Pulfrich lenses are great for use on TV, Video, DVD, Blu-ray, as well as on the web.